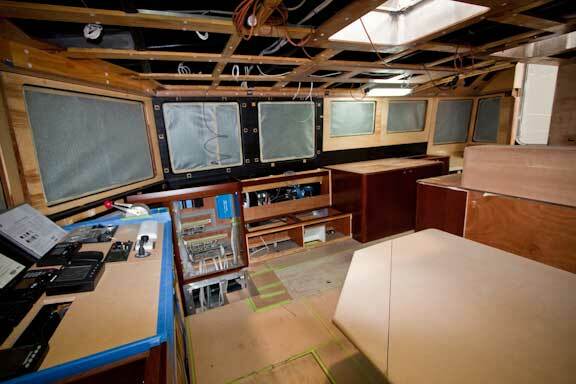 The windows of the first FPB 64 are covered to protect them, as a result with the photos that follow it is hard to get a feeling for space which will come when the boat is at anchor. 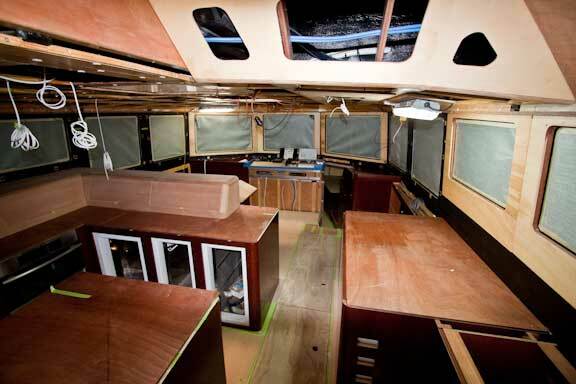 So we will first show you some shots of the second boat, with the windows not yet installed, and work on its interior is in its early stages. Hopefully this will impart a sense of the space with which we are dealing. This photo is taken from the forward port corner of the great room. The bridge desk extends forward of the framework in the left corner of the photo. Add to this image light blue water, dark blue sky, trade wind clouds, a white beach, and palm trees, and you will start to conjure up the feeling of spaciousness that will occur when we are afloat. 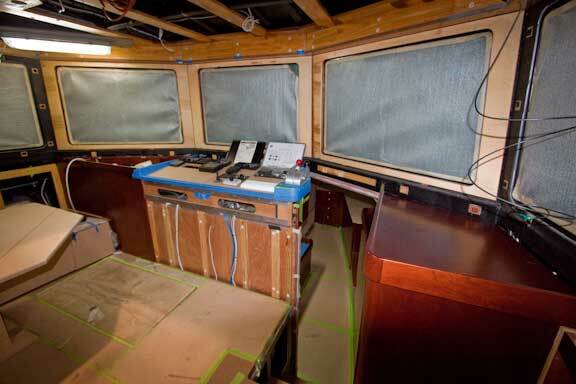 Note the protected windows of the first FPB 64 through the starboard side of the second boat. OK, now to the first FPB 64 and its interior. This is the view from the watertight door to the exterior. The wet gear/coat locker is to port. There will be a waist high rail to starboard and hand rails at shoulder height. 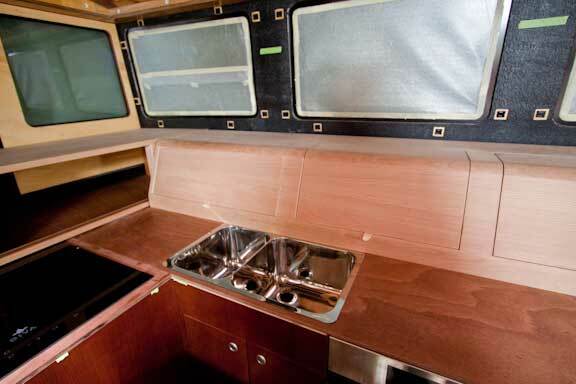 The galley has excellent storage space, and a cozy, secure feeling. Note that the counter top lockers have not yet been trimmed to fit the structure and are about three inches (75m) too wide. 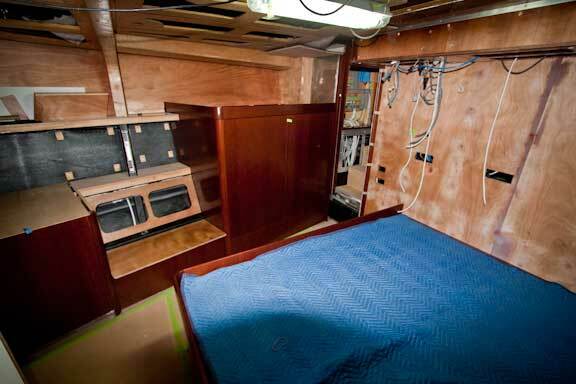 The vertical bulkhead on the left of the photo is the outside of the large (self draining) foul weather gear and coat locker. This is an ideal location for art work. This view is from the aft end of the salon/forward edge of the fridge box. There is always a conflict between a functional, enjoyable galley with good storage, and visual space in the rest of the great room. 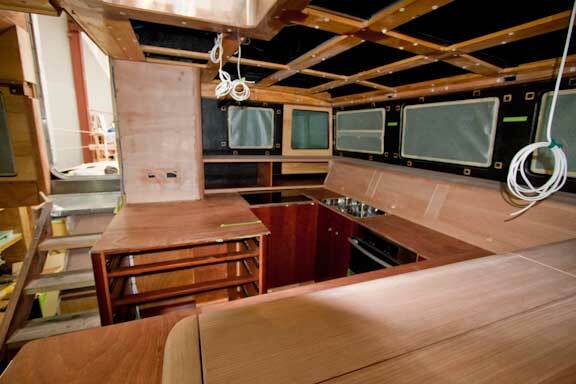 As you can see, this galley has a huge amount of storage – more than many homes. We are able to maintain an open spacious feeling to the great room because of the seventeen windows. Your eyes will be drawn over the furniture and out of the windows. Most of the lockers have hinged lids for easy access. 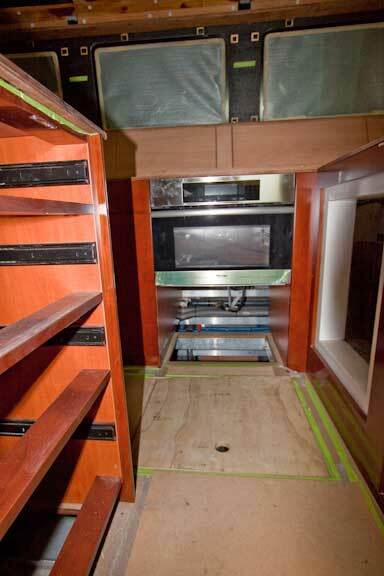 The locker across the aft end of the galley uses sliding doors. This allows you to use the top as a shelf for baskets, appliances, or perhaps just a bouquet of flowers or a bowl of fruit. 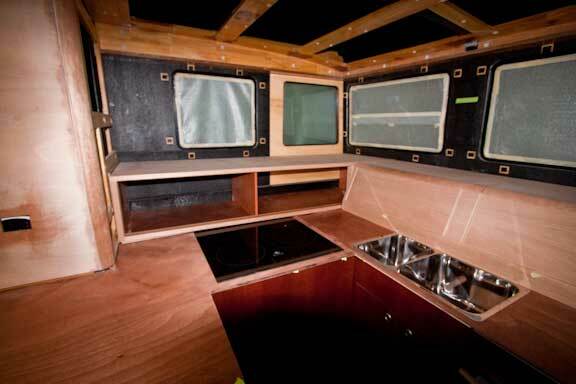 The induction cook top (left) will be fitted with sea rails. 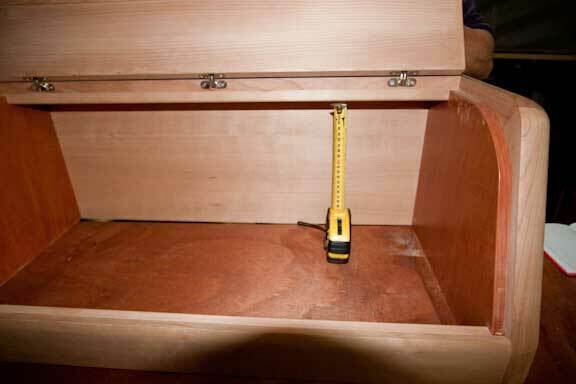 The hinged (angled) locker faces move outboard about three inches (75mm) when they are trimmed from what is shown here. 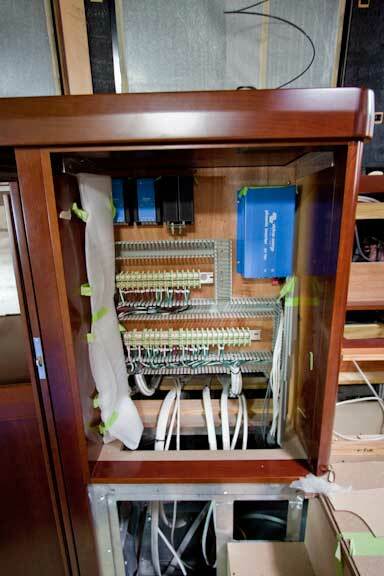 Four large and very deep drawers reside within this cabinet. 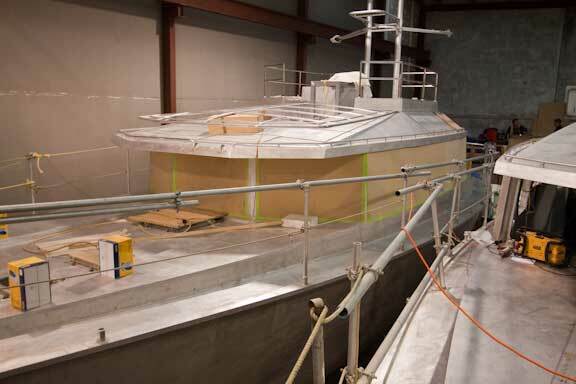 The stairs shown throughout the boat are for the building process. Finished stairs are a little nicer! We are looking across the boat to port at the Miele speed oven. The dishwasher goes below this. These hinged lid lockers on top of the counters have eleven inches (290mm) of inside storage space. That is enough for most galley appliances, cereal boxes, and large size canisters. The hinged lids make access easy. Moving on now to the forward end of the salon and the inside bridge area. This photo is shot from the middle of the settee to starboard. There is space for three monitors centered (two of which are shown here). The helm chair will be on the right side, where the camera is positioned. Engine controls, radar, sonar, autopilot, engine instruments and primary VHF are all close at hand. Note the space to port of center, below the second auto pilot head (open slot) and Maretron NMEA 2000, display for a computer keyboard and mouse. Looking here to the port corner of the bridge and across to starboard. The table mock up is to the right in the photo. Note the hinged table section which folds under the table when not in use to provide more cabin sole space between the table and helm chair. 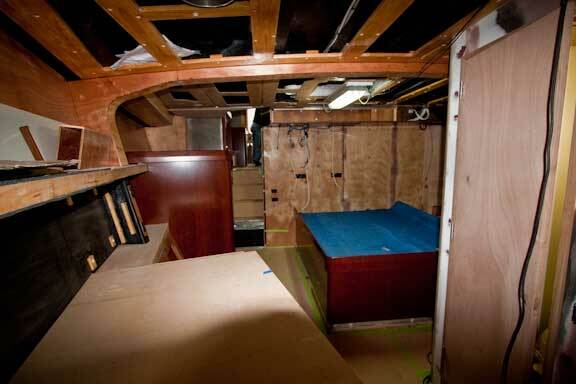 In the forward starboard corner of the great room, at the foot of the settee, is where the main AC electrical panel and bridge area DC panels reside. We are in the Owner’s suite now, with the camera looking forward from the stairway forward. Those two sections of bulkheads are ideal for art work, which will expand the visual space immensely. Here we are at the foot of the bunk, looking across to starboard. The camera is positioned now in the aft port corner. 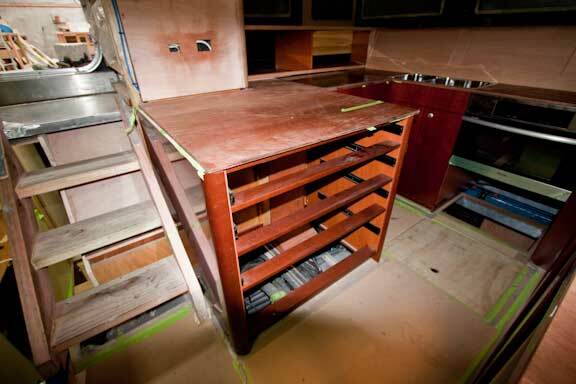 The counter top lockers (similar to the galley) have yet to be installed. Finally, looking aft from the forward end of the Owner’s suite. 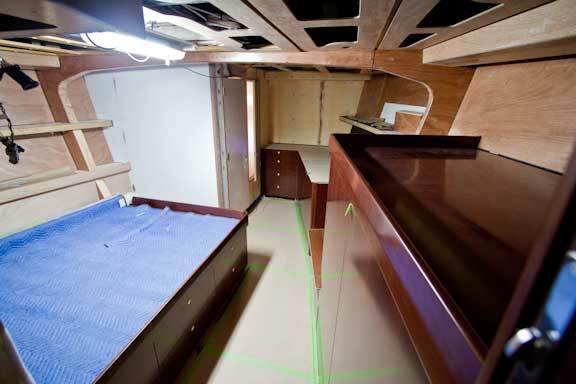 Note the bulkhead behind the bunk has been kept clear for art work. 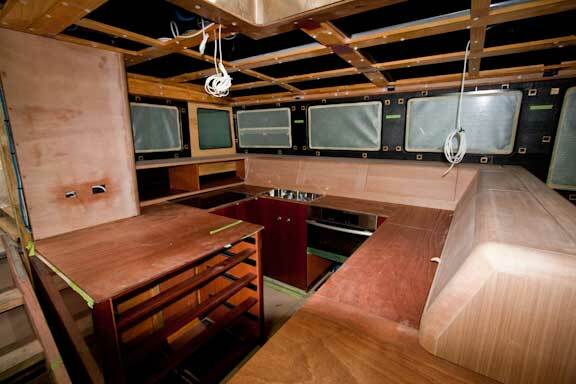 A few final thoughts on the interior of the FPB 64. 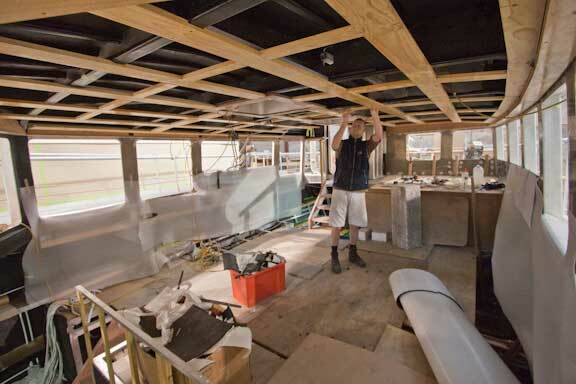 The crew at Circa are doing a lovely job, as you would expect from Kiwi carpenters. Although we could be considered biased observers, we think the space tradeoffs work really well. The great room and Owner’s suite are simply marvelous. 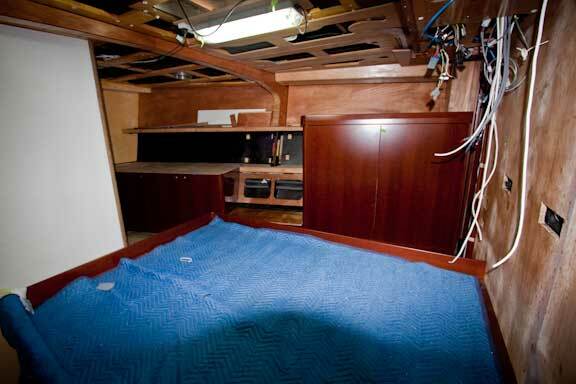 The aft end of the boat, which we did not have time to photograph, is going to do its job well, providing one nice guest suite and a second sea cabin The office has turned out better than we expected. If you are having a hard time visualizing the build quality from these photos, which is understandable, go back and review the engine room images in Update 22A. It is the same management team at Circa running both parts of the boat. For larger versions of all the photos from this visit to Circa click here. To read the engine room post click here. And for large sized photos of the FPB 83 Wind Horse click here. This entry was posted on Tuesday, November 24th, 2009 at 7:36 pm and is filed under FPB 64 Updates. Both comments and pings are currently closed. 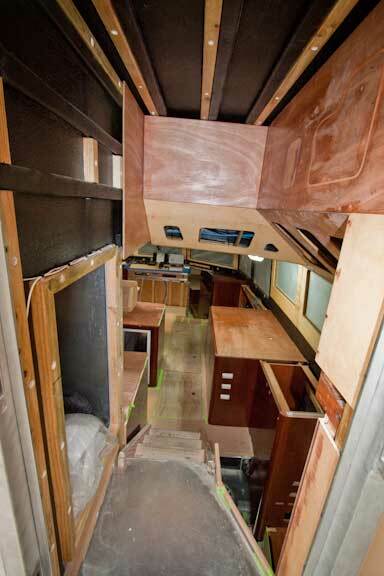 Engine room and interior photos are up now. More to come next week when we are caught up. The full set without captions are available as a slide show on our video link at the top of the SetSail web page. This is actually intentional. The outboard side of the lockers was built long to allow it to be scribed and fitted to the boat. In theory, with the metal cut files being and furniture developed from our 3D model, this should not be necessary. But if you are short 6mm it is a disaster and it is as easy to be 75 mm long as 7mm. The second set of furniture will be built much closer since Circa will have the experience with the first. Wow its looking great. I’ll check out the video link after work. If only i had the time and money to build my own! I have a question on the hinged lid lockers on top of the counters. Will there be a gas shock or someway to lock them in the upright position? It seems to me that if you are in any seas and that closed unexpectedly it would really hurt a mis placed hand. There is a mechanical strut to support the lids which we have been using for years. They work quite well, I cannot think of an instance in the last 100,000 miles at sea in which we have personally used this system where there was a problem. What are the dimensions of the master and other beds (I’m 6′ 3″)? Also, would it be possible to put up an image of the 64 with painted external surfaces? 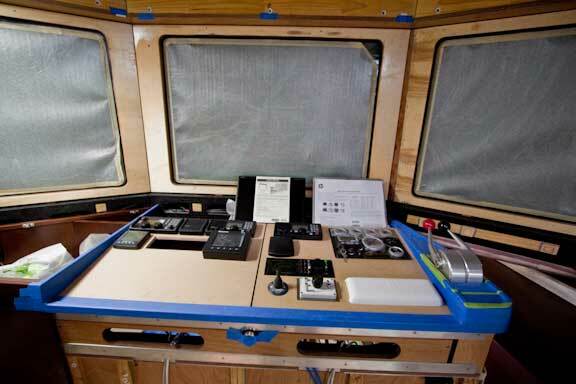 The bunks are 2060mm (6’8″) long. Three of our first four owners are your height (or more!) so there must be something about the FPB 64 that appeals to those with a lofty view of the world. I will see if we can figure out a way to show the boat with a paint job (no promises here).